When it comes to shopping for women's plus size fashion belts, selections need to be made carefully. While there are many belt choices for full-figured women, it could take some trial and effort to find the perfect one that fits well and flatters your curves. Belts are a great, inexpensive fashion accessory. They brighten up otherwise plain-looking clothes, secure a pair of pants that are loose in the waist, or cinch in a too-big shirt so it fits better. Many outfits can be accessorized with belts, but the key is to choose a belt style to work well with both your outfit and your body type. Sashes can be fashioned from scarves or made from a textile such as leather, cotton or even ribbon. 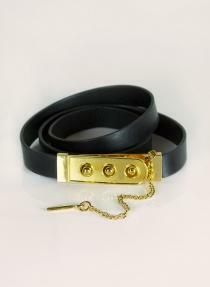 These belts can be worn tied loosely at or slightly above the hips, or even around the waist. Sashes look great with a long shirt, tunic or dress and help create the illusion of a waistline especially for those with apple, pear or rectangle body types. Obi belts are long sash-type belts that are worn wrapped around the waist from front to back with the ends brought forward to the front of the belt and tied into a bow or fancy knot. They flatter all body types except the apple shape. For the most part, skinny leather belts look great with jeans or pants with belt loops. However, if you tend to have a smaller waist, but larger hips, make sure your pants fit well before trying to hold them up with a belt. Skinny leather belts, or similar thinner styles, tend to pull on the back loops and may cut into the back and hips if the pants aren't the right size. Skinny belts flatter rectangle or apple body shapes because they define the waist area and balance the bust line and hips. 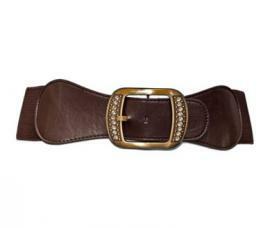 Wide buckle belts are belts made of any material at least two to three inches wide and featuring a decorative buckle. These belts are most flattering when worn sitting right above the hips as the buckle draws the attention away from the hip area. Apple and rectangle body shapes can use wide belts in contrasting colors to create the illusion of a waistline and balance out the silhouette. 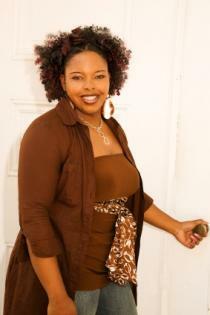 Short plus-size women should avoid wide belts as the belt cuts the figure at mid-point and will make them look shorter. Women with larger busts and hourglass figures may find a wide belt over-emphasizes the bust area and makes the body look asymmetrically unbalanced. While cinch belts may not be the best choice for every plus size woman, they are uber flattering for those with small stomach and hip areas. 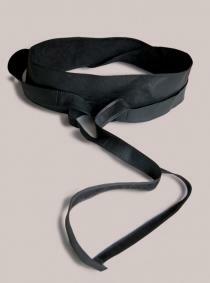 This style of belt has either a hook and eye or a Velcro closure in the back or front. They range from three inches wide to about eight inches. The thicker belts are also known as corset belts as they are worn like that style of lingerie. They can be made from leather (or its equivalent) or elastic. Chain belts add a bit of glimmer and flare to a pair of jeans or a long tunic. This style flatters almost any curvy body type, as the design draws attention away from any problem areas and creates a V-shape line that makes the body look taller and slimmer. Many of these belts are available with extensions, so they can fit any plus size woman. Belts adorned with sequins, beads, bows or dazzling gems are the perfect accent to holiday outfits or special occasion wear for full-figured women. They add just the right amount of sparkle and interest to an otherwise ordinary ensemble. Embellished belts are the perfect fashion accessory for pear, rectangle or hourglass figures because they define the waist and balance the body shape. However, pear shapes will look longer and leaner when the belts and outfit colors match. Rectangle body types are flattered by contrasting belt and outfit colors. Hourglass figures can match or contrast belt colors with ease. Are you harboring an inner cowgirl just waiting for release? 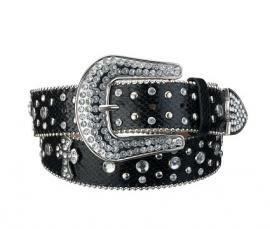 Western belts are an easy way to add some country flair to almost any outfit, and they can look great on curvy figures. Typically made from leather or synthetic materials, these belts can be minimalist and simple or embellished with options such as turquoise stones, crystals or rhinestones, or leather tooling. Belt styles range in width from ultra-skinny to chunky but will always have a Western theme. 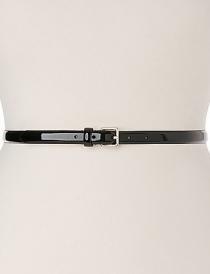 Full figured women with apple and rectangle body types should choose skinny or narrow belts for the most flattering look. 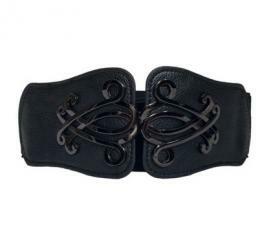 Those with hourglass and pear shapes will look great in almost any style of Western belt. 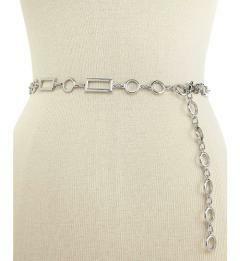 IGIGI carries a nice variety of plus size belts in sizes from 18 to 32. Prices range from less than $40 to around $60. Shop IGIGI online and while you are on the site, sign up for email alerts to be the first to know about sales, newly arrived styles, and special events. Finding the closest IGIGI store is easy to do by using the store locator. Purchases ship to domestic and international addresses for rates ranging from under $10 to around $55, depending on the service and speed of shipment selected. Shipping charges are nonrefundable. If you are dissatisfied with your purchase, return the unworn, unaltered items within 45 days with all labels and tags attached. Refunds are issued for regular price items returned within 45 days. Sale rack items can be returned for store credit only, while final cut items may not be returned, as they are final sales. Lane Bryant offers a wide selection of belt styles in plus sizes from 18 to 28, at prices ranging from under $20 to under $40. They offer free shipping for items shipped to a store location or a low, flat rate for items shipped to one's home. Purchases can be shipped to domestic or international addresses; shipping charges are nonrefundable. If you are shopping in a Lane Bryant store and having trouble finding a size or color you want, ask a store associate about their LB2ME program. Use their in-store Look Book to find the items you want. Pay for the purchase and have it shipped to the store for free. Returning items is hassle free; just return unwanted items to a store or send back by mail. One Stop Plus offers the convenience of shopping online from a wide range of brand names such as Woman Within, Jessica London or Roaman's, providing a larger pool of plus size belt choices and the ease of shopping from your computer 24/7. The cost for the OSP Shopper's Club is under $20 for a full year, and you can cancel at any time. You can pay for your purchase with major credit cards, PayPal or the One Stop Plus credit card, which gives you access to discount coupons and a fee-free card. Women's plus size fashion belts are trendy, fun and functional accessories to wear with a number of different outfits. With the wide variety of stylish belts available, you are certain to find many that will look fabulous no matter what outfit you're donning.